A few weeks ago I saw this pose doll. They are a dime a dozen at thrift stores. I almost always see one every time I go in. Pose dolls remind me of my grandma. She had quite a few and I remember admiring them as a little girl. I thought their dresses were so pretty back then. Now I just think they are super gaudy, but I still love their cute mod- style faces. 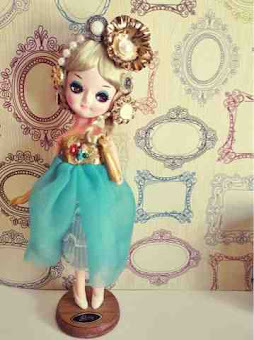 This particular doll was smaller than most pose dolls I had seen and I decided she would make a fun project to make over. 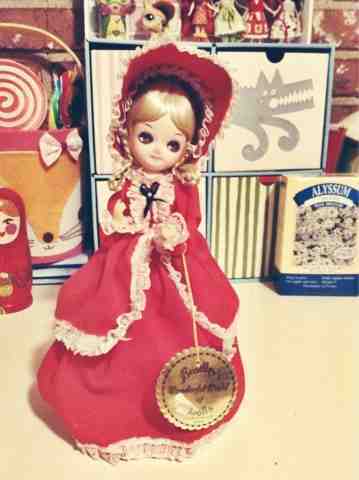 The first thing I did was remove the ugly Holly Hobbie red dress and bonnet. The dress and hat were glued on so it took awhile to remove. I was then left with a styrofoam body,these cute cream high heels, and her stand. I guess this pose doll's name is Sherry. I had a vintage doll dress in my stash that fit Sherry perfectly. 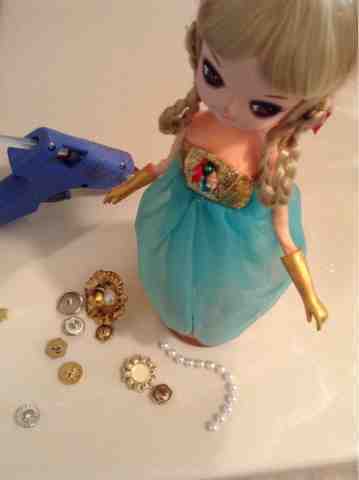 I attached the dress to her body with sewing pins. Then I went to my button stash and made her a crown attaching it to her head with hot glue. Her arms were plastic half way up. It looked funny just leaving that part flesh colored. So I painted the plastic part of the arms gold to make them look like gloves. I then re-did her make up just a bit. I took some pink pastel and gave her rosy cheeks. I also painted on some blue eye shadow to match her new dress. 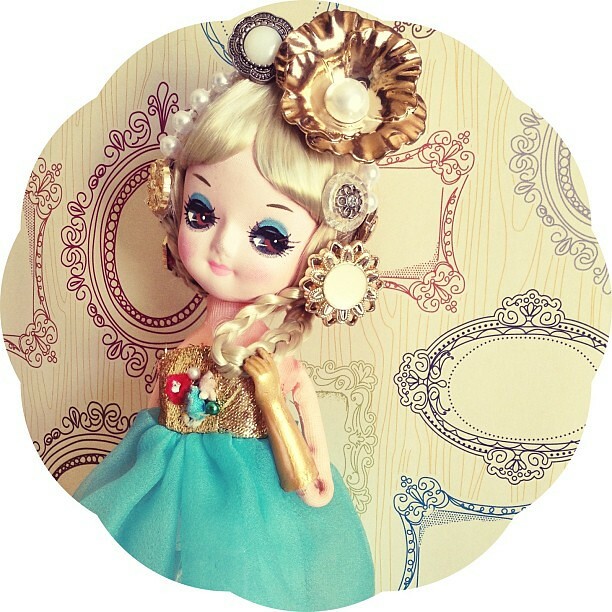 Sherry has gone from Miss Priss to Princess Cutie Kitsch. She looks happy with the fresh new makeover.